According to a story by Reuters Friday, a recent study determined that moustache-wearers earn 4.3 percent more than their clean-shaven compatriots. The survey -- which claimed to have randomly sampled 2,000 moustachioed men, 2,000 bearded men and 2,000 fully-shaved men -- went on to assert that those with hairy lips also tended to spend 11 percent more and saved 3 percent less than their bearded and barefaced brethren. As the proud owner of a handlebar moustache, I would love it if this story were true. Unfortunately, the study appears to be a joke. It was commissioned by the American Mustache Institute, a tongue-in-cheek advocacy group tasked with "protecting the rights of, and fighting discrimination against, moustached Americans by promoting the growth, care, and culture of the moustache." Even ignoring the study's occasionally bizarre assertions, there doesn't seem to be any evidence to corroborate the existence of principle researcher Hans Menjou-Bärtchen, or his company, "Menjou-Bärtchen Research Consultants." Many of the study's conclusions seem questionable at best. For example, it claims that bearded Americans spend almost 50 percent of their income on a combination of breakfast pastries, beard combs, lice removal kits, overalls and semi-automatic weapons. Moustachioed men, on the other hand, allegedly spend a significant amount of their income on Hall & Oates music memorabilia and Chuck Norris DVDs. By comparison, clean-shaven men supposedly spend 64 percent of their money on Levi's Dockers pants, signet rings, sports beverages, vitamin supplements, strip-mall haircuts, and Zima. Actually, that doesn't seem totally unrealistic. Un-moustached men do drink a lot of Zima. The AMI's fake study aside, it seems like facial hair is having a renaissance. The NPD Group -- an honest-to-goodness real-life marketing research agency -- claims that sales of electric shavers and facial hair trimmers are down 12 percent this year. Granted, this could be a function of recessionary cutbacks and pricey Mach-III razor cartridges, but there is something tantalizing about the possibility that a great 'stache revolution is brewing. Besides, there are a surprisingly large number of facial-hair events in the offing. 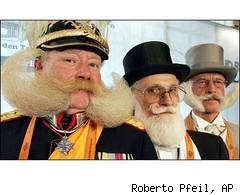 In addition to the World Beard and Moustache Championship -- the Westminster Kennel Club Dog Show of moustache contests -- there's AMI's Moustachioed American of the Year Contest, Moustache-a-Thon, and 'Stache Bash 2009. Perhaps most importantly, there's Movember, a month-long moustache-honoring contest that raises money to help combat men's health issues. Begun in Australia in 2003, the event has spread around the world, and helps to fund prostate and testicular cancer research. Fake, Reuters-confounding surveys aside, one thing is clear: the moustache now reigns supreme. Whether in facial hair contests or Hall & Oates concerts, barbershop quartets or Beastie Boys videos, moustachioed men, your time is now!